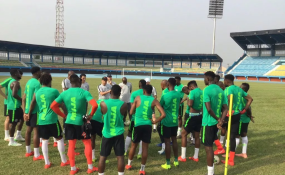 Super Eagles begin training in Asaba ahead of Seychelles, Egypt ties. Super Eagles coach, Gernot Rohr, has said the present Super Eagles team lacks 'star players' like it used to in the past. In an interview with The Interview on Tuesday, Rohr said the present Super Eagles squad has team spirit "but lacks star players like Austin Okocha and Nwankwo Kanu". "We have to be optimistic but if you look at our players, how many of them are playing for big clubs? Who among them is playing in the Champions League? "I watched the last champions' league games and no Nigerian players. We don't have the big players like we used to have in the past; the likes of Austin Okocha, Nwankwo Kanu, Vincent Enyeama and the rest," he said. "What we have now is team spirit; we don't have the stars again. We have young players like Alex Iwobi playing for Arsenal in the Europa League even though he was on the bench in their last game. Our strength is the team and I hope it will take us far in Egypt," said Rohr.